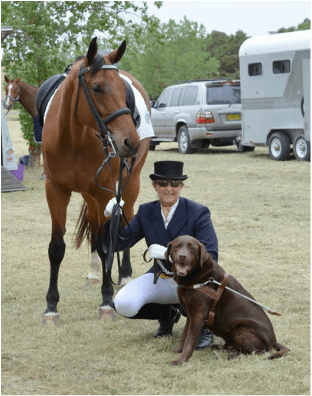 Sue-ellen Lovett is a blind dressage rider who has competed in two Paralympic Games (Atlanta 96 & Sydney 2000) and won a Bronze Medal at the World Championships in Denmark in 1999, all on loan horses. With her stock horse Hectic she was successful in open small tour events in 1995 and has been riding at FEI level consistently since 1985. Sue-Ellen has trained 7 horses to Prix St Georges/Intermediare 1 level including her new horse ”Desiderata”. The name is Latin for desire and he epitomises her great desire to compete at Grand Prix level. “He has proved a challenge to me because of his nervous demons that made him shy at sounds, sights, changes of environment, so we were not a great combination” Sue-ellen explains. Prior to that Sue-ellen was worried about the misinformation that circulates in horse circles about herbs and swabbing. The program started in September 14, after she had no luck with just adding a few dried herbs to the feed. She was also looking for help with some competition nerves of her own, mainly due to Desi’s tendency to become easily distracted. Sue-ellen is taking the same Bach flower essences as Desi, as treating both sides of the partnership at the same time enhances the effect of both. Because Sue-ellen rides and trains alone most of the time, it was of paramount importance to bring Desi to the most positive side of his personality and to also have him physically fit without being over the top in any way. “I am absolutely delighted with the huge improvement in him, he is now attentive to me so we are able to progress more quickly in our training. Although we still have a long way to go to realise my ambition of competing Grand Prix, I now own the ride and I have confidence in Victoria’s program for his physical and emotional health and wellbeing. Sue-ellen has only had the 11 year old 17 hand Arabian Warmblood for a year and he has recently had his first start at Prix St George, Intermediare 1 after winning Champion Advanced at Dubbo last year. They are now working hard to qualify for CDI competition. The history of flower essence therapy dates back to the 16th century and spans many cultures. It started with the great healer and mystic Paracelsus who collected the dew from flowers to treat his patients’ emotional imbalances. The culture was also known to the Australian aborigines, the Egyptians, Malays and Africans and was probably used by other ancient civilisations. It was virtually lost until the great revision and expansion led by Dr Edward Bach in the 1903’s. More recently Sydney naturopath Ian White has followed in his footsteps, applying the age old method to the flowering plants of the Australian bush. The Bach and Australian Bush Flower essences are an essential part of today’s holistic approach to healing. They have been found to be extremely effective for horses and other animals who often react more quickly to them than humans do. There can be no placebo effect with animals. Flower essences are not homeopathic, herbal or aromatic in their preparation, but they are similar to homeopathics in that they are vibrational in nature and physically dilute. The mode of action of the flower essences does not use pharmacologic means but influences the animal or person by manipulating “energy”, balancing the mental, emotional and physical balance of the individual. 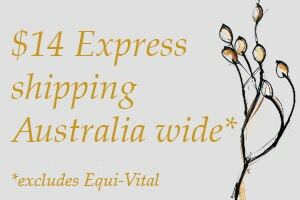 This means that flower essences can be used with complete peace of mind for horses and riders in competition as it is impossible for any detection by swabbing, which also applies to homeopathic preparations.